Mission: To provide the best play-by-play & analysis of all sports in the broadcasting world. Description: Shawn Walli & Sean Boyd; a dynamic duo on the microphone in the sports broadcasting world. Information: The Double S Xpress was born in Tacoma, WA in 2005. Shawn Walli & Sean Boyd joined forces to call Tacoma Thunder IBL basketball games on 1180AM KLAY. 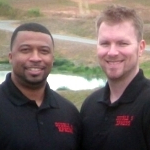 Shawn & Sean freelance for the major sports networks like NBC Sports, ESPN, CBS Sports, & MLB Network to name a few. My beginnings started like most children, with an ambition to make it in sports. It goes back to countless hours of acting as my favorite sports superstars in the backyard. This would include buzzer beater's and Hail Mary';s with personal commentary. I loved the commentary, and it was then I knew that this would be my passion. I was blessed to run track and field at Eastern WA and Auburn Universities. I was also on two National Championship teams. I went on to be Head Coach of girls basketball and track at Clover Park HS in Lakewood, WA. I was also an Assistant Football Coach for the Warriors as well. With this knowledge of various sports, I decided to follow my dream of becoming a sports broadcast. I handled color analyst duties for Tacoma Thunder broadcasts on 1180 KLAY. I have freelanced for TV sports networks in the Bay Area since 2006. As I continue to write this chapter, with my great friend Shawn Walli, join us as we share our sports knowledge with you. Watching the Seattle Mariners on TV, at the young age of 10, I told my mom that I wanted to be just like Mariner broadcaster Dave Niehaus. Since that day I have been working toward a career in sports broadcasting. While focusing on media courses at South Puget Sound CC in Olympia, WA, I was the final sports intern at KSTW-TV in Tacoma. While taking Broadcast Production at Bates Tech. in Tacoma, I was a sports intern at KING-TV in Seattle. At KING I was able to interview Alex Rodriguez after his first game back in Seattle with the Texas Rangers. In October of 2000, I started freelancing for the major sports networks in Seattle, Spokane and Portland. I have worked many sporting events including: the 2001 MLB Home Run Derby, NCAA Basketball Tournaments, the 2003 Apple Cup, countless Seahawk games, and the 137the Kentucky Derby. I joined forces with Sean Boyd in 2005 as the radio broadcast team for the Tacoma Thunder. The Double S Xpress could be heard on KLAY 1180-AM. I want to thank you guys for another great show this past Monday. I truly enjoyed your interview with Ephraim Salaam. I especially enjoyed hearing him talk of his high school experience & how his counsellor said he would never be a success in Football. His story proves that how important it is to believe in yourself & your talents. I have been listening to your show for some time now & I must say that last night's interview with Jake Olson was inspiring. Jake Olson is one of those rare individuals that had a devastating blow to his health and turned it into something positive not only for himself but also for others. Thanks again for the engrossing interview and I look forward to your next show.